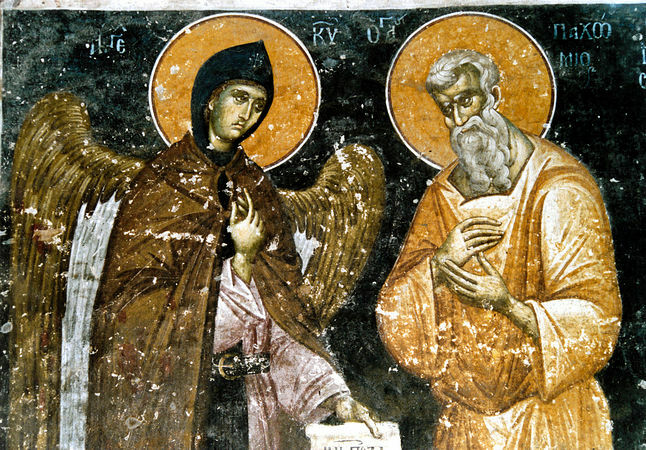 Saint Pachomius the Great was both a model of desert dwelling, and with Saints Anthony the Great (January 17), Macarius the Great (January 19), and Euthymius the Great (January 20), a founder of the cenobitic monastic life in Egypt. Saint Pachomius was born in the third century in the Thebaid (Upper Egypt). His parents were pagans who gave him an excellent secular education. From his youth he had a good character, and he was prudent and sensible. When Pachomius reached the age of twenty, he was called up to serve in the army of the emperor Constantine (apparently, in the year 315). They put the new conscripts in a city prison guarded by soldiers. The local Christians fed the soldiers and took care of them. When the young man learned that these people acted this way because of their love for God, fulfilling His commandment to love their neighbor, this made a deep impression upon his pure soul. Pachomius vowed to become a Christian. Pachomius returned from the army after the victory, received holy Baptism, moved to the lonely settlement of Shenesit, and began to lead a strict ascetic life. Realizing the need for spiritual guidance, he turned to the desert-dweller Palamon. He was accepted by the Elder, and he began to follow the example of his instructor in monastic struggles. Once, after ten years of asceticism, Saint Pachomius made his way through the desert, and halted at the ruins of the former village of Tabennisi. Here he heard a Voice ordering him to start a monastery at this place. Pachomius told the Elder Palamon of this, and they both regarded the words as a command from God. They went to Tabennisi and built a small monastic cell. The holy Elder Palamon blessed the foundations of the monastery and predicted its future glory. But soon Palamon departed to the Lord. An angel of God then appeared to Saint Pachomius in the form of a schemamonk and gave him a Rule of monastic life. Soon his older brother John came and settled there with him. Saint Pachomius endured many temptations and assaults from the Enemy of the race of man, but he resisted all temptations by his prayer and endurance. Gradually, followers began to gather around Saint Pachomius. Their teacher impressed everyone by his love for work, which enabled him to accomplish all kinds of monastic tasks. He cultivated a garden, he conversed with those seeking guidance, and he tended to the sick. Saint Pachomius introduced a monastic Rule of cenobitic life, giving everyone the same food and attire. The monks of the monastery fulfilled the obediences assigned them for the common good of the monastery. Among the various obediences was copying books. The monks were not allowed to possess their own money nor to accept anything from their relatives. Saint Pachomius considered that an obedience fulfilled with zeal was greater than fasting or prayer. He also demanded from the monks an exact observance of the monastic Rule, and he chastized slackers. His sister Maria came to see Saint Pachomius, but the strict ascetic refused to see her. Through the gate keeper, he blessed her to enter upon the path of monastic life, promising his help with this. Maria wept, but did as her brother had ordered. The Tabennisi monks built her a hut on the opposite side of the River Nile. Nuns also began to gather around Maria. Soon a women’s monastery was formed with a strict monastic Rule provided by Saint Pachomius. The number of monks at the monastery grew quickly, and it became necessary to build seven more monasteries in the vicinity. The number of monks reached 7,000, all under the guidance of Saint Pachomius, who visited all the monasteries and administered them. At the same time Saint Pachomius remained a deeply humble monk, who was always ready to comply with and accept the words of each brother. Severe and strict towards himself, Saint Pachomius had great kindness and condescension toward the deficiencies of spiritually immature monks. One of the monks was eager for martyrdom, but Saint Pachomius turned him from this desire and instructed him to fulfill his monastic obedience, taming his pride, and training him in humility. Once, a monk did not heed his advice and left the monastery. He was set upon by brigands, who threatened him with death and forced him to offer sacrifice to the pagan gods. Filled with despair, the monk returned to the monastery. Saint Pachomius ordered him to pray intensely night and day, keep a strict fast and live in complete solitude. The monk followed his advice, and this saved his soul from despair. The saint taught his spiritual children to avoid judging others, and he himself feared to judge anyone even in thought. Saint Pachomius cared for the sick monks with special love. He visited them, he cheered the disheartened, he urged them to be thankful to God, and put their hope in His holy will. He relaxed the fasting rule for the sick, if this would help them recover their health. Once, in the saint’s absence, the cook did not prepare any cooked food for the monks, assuming that the brethren loved to fast. Instead of fulfilling his obedience, the cook plaited 500 mats, something which Saint Pachomius had not told him to do. In punishment for his disobedience, all the mats prepared by the cook were burned. Saint Pachomius always taught the monks to rely only upon God’s help and mercy. It happened that there was a shortage of grain at the monastery. The saint spent the whole night in prayer, and in the morning a large quantity of bread was sent to the monastery from the city, at no charge. The Lord granted Saint Pachomius the gift of wonderworking and healing the sick. Toward the end of his life Saint Pachomius fell ill from a pestilence that afflicted the region. His closest disciple, Saint Theodore (May 17), tended to him with filial love. Saint Pachomius died around the year 348 at the age of fifty-three, and was buried on a hill near the monastery. By a flood of tears you made the desert fertile, / and your longing for God brought forth fruits in abundance. / By the radiance of miracles you illumined the whole universe! / Our Father Pachomius pray to Christ God to save our souls! After living the life of the angels in the body, / you were granted their glory, God-bearing Pachomius. / Now standing with them before the throne of God, / you pray that we all may be forgiven.